It’s even scarier when his mouth moves. Much has been made of Donald Trump‘s distinctive looks, from his small hands to his orange-hued face to whatever’s going on with his hair, but creative people are still discovering new territory when it comes to clowning the president of the United States. The latest thing: Trump’s chin looks like a frog. Once you see it, it’s difficult to picture it any other way. The trope started Monday with a tweet by artist Mike Mitchell, introducing “a frog painted on his face” as Trump’s newest cabinet member. Mitchell followed up with a couple more Trump-frog tweets, establishing the look of the president’s facial amphibian and turning it into meme canon. In Mitchell’s imagining, the frog is something like the Hypnotoad from Futurama. It’s the real president, using Trump’s body as a convenient vessel to carry out its froggy will. Tens of thousands of retweets later, the Trump-Frog has caught on with other artists, who are contributing their own work to the meme. Regardless of who’s drawing it, the frog is always green, with a yellow belly and bright orange eyes. This isn’t the first time Trump has been depicted as a frog, the most meme-able type of animal on the internet. His supporters love to morph him into beloved-meme-turned-alt-right-mascot Pepe the Frog, but Trump supporters tend to consider that a positive portrayal. 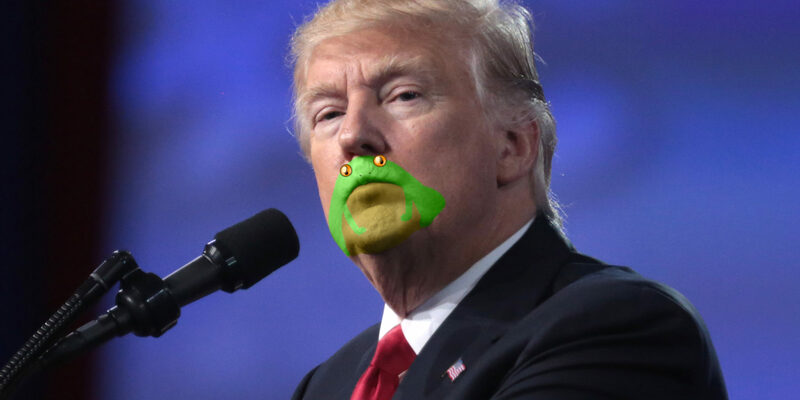 This new freaky frog-face is much less friendly to the president, and it would probably get under Trump’s thin chin-skin if it ever made it onto cable news where he could see it.